The 2016 Cameco Teams for Dreams Gala was the third event in our three year commitment and raised funds for the American Cancer Society. Country music artist Collin Raye headlined a special night in Cheyenne on Sept. 16 as the Cameco Teams for Dreams gala raised money in support of the American Cancer Society. The event, which also featured Teams for Dreams ambassador Sherry Brendel and University of Wyoming head basketball coach Allen Edwards, aimed to shed light on an unfortunate cancer reality: Wyoming is last – 50th out of 50 US states – in colo-rectal screening rates. In its third year of a three-year commitment, Cameco Teams for Dreams is a unique partnership between Cameco Resources, University of Wyoming Intercollegiate Athletics, the American Cancer Society and the Wyoming Community Foundation. A volunteer selection committee that includes health professionals and others treats each application with care. Many others from around our communities help by purchasing special items at University of Wyoming football and basketball games, or attending the annual gala. One of the many items up for bid at the event's silent auction. 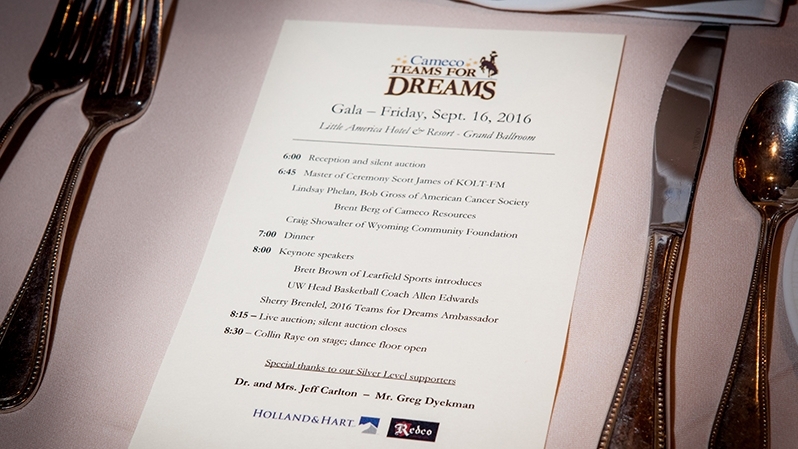 Country music artist Collin Raye headlined the Cameco Teams for Dreams gala. A heartfelt thank you to all who enjoyed the evening and helped raise money in support of the American Cancer Society.